AUSTIN – Texas schools would be graded with new standards – highlighting an emphasis on college readiness in high schools – while student testing would lose much of its punch in lower grades under school improvement bills the Legislature passed Wednesday. Similar bills approved by the House and Senate would call on high school students to show college readiness on the state's new English III and Algebra II tests to earn a diploma – with the Senate proposing a higher standard for passage than the House. But elementary and middle school students would no longer have to pass the TAKS test in certain grades to be promoted under both measures. The bills would take some pressure off teachers and administrators to focus on preparation for state tests by allowing school districts to devise their own promotion standards – utilizing test scores, course grades and teacher recommendations. Students in grades 3, 5 and 8 would no longer have to pass the state test for promotion. In addition, annual state performance ratings for schools and districts would be revamped, with growth in student achievement – as measured by state tests – the key factor rather than just minimum passing rates of students. Test scores over three years – rather than just one year – would be considered in performance ratings so a district or campus would not be penalized for one off-year. Student dropout rates and each district's financial condition would be other factors in the ratings. The Senate approved its school accountability bill first, on a unanimous vote, while the House followed suit Wednesday evening by unanimously approving its bill. The two chambers will iron out their differences on the legislation over the next few weeks. House Public Education Committee Chairman Rob Eissler, R-The Woodlands, told House members that the new school accountability system was necessary because the old standards have not been getting results. "The current system did not help our kids as much as we thought it would," Eissler explained. "We have serious, serious achievement gaps in terms of preparing students for college." Eissler said while scores on the Texas Assessment of Knowledge and Skills jumped substantially over the years, Texas scores on the ACT and SAT – the nation's two major college entrance exams – have remained flat. "What we want to do now is aim at college readiness because 86 percent of new jobs in the future will require at least some coursework in college," he said. Senate Education Committee Chairwoman Florence Shapiro, R-Plano, said for the first time college readiness will be a major part of the school accountability system. "This bill would make significant changes for students and for schools, but the overarching goal is to raise the bar so that Texas students are prepared for success in life," she said. Regarding provisions in the bill that would affect low-performing schools, Shapiro said the state education commissioner would have more flexibility to deal with those campuses – including an additional year for such schools to turn around their performance before facing closure. "Our goal is to do improvement, not punishment – standards, not excuses," she said. Other provisions in one or both of the bills would eliminate the requirement that school districts spend at least 65 percent of their funds on classroom instruction and prohibit districts from having grading policies that force teachers to give minimum grades to failing students. An amendment approved in the House would prohibit school districts from regulating the hair length of honor students who have no disciplinary record or unexcused absences. School districts would be evaluated annually based on student test scores, dropout rates and financial integrity – receiving one of three ratings from good to bad: accredited, accredited-warned and accredited-probation. Districts doing poorly for multiple years would lose their accreditation – and state funding. Campuses would be rated acceptable or low-performing based on test scores and dropout rates, with high-performing campuses getting recognized for "distinction" in subject areas where they excelled. High school students would follow one of three graduation plans – basic, recommended and advanced – with most students encouraged to the take the recommended plan to prepare for college. Students in that plan would have to have four credits in each of the four core subject areas – English, math, science and social studies. A credit is equal to a year of instruction in one course. Two credits in foreign language also would be required along with eight elective credits under the recommended plan. Students would only be allowed to take the "basic" graduation plan – which has less-rigorous course requirements – with the consent of their parents. Schools that have a large number of students graduating under the basic plan would face an inquiry from the Texas Education Agency under both the House and Senate bills. The good news for Texas is that more Hispanic students are attending college than ever before. The bad news is that they lag behind all other ethnic student groups in several important areas, and there are few indications that the situation will improve anytime soon. As reported by the Chronicle’s Jeannie Kever, when compared with other ethnic groups, fewer Hispanic students graduate from high school in four years and fewer of them enroll in college or a technical training program. A state plan, Closing the Gaps, was created in 2000, with a goal of raising overall Texas college enrollment rates, which then stood at 5 percent of the population, to the national average of 5.7 percent by 2015. The state’s overall enrollment now stands at 5.3 percent. The rate for Hispanics has increased from 3.7 to 3.9 percent. That’s not good enough, said Raymund Paredes, higher education commissioner for Texas. He told Kever that with such numbers, the state cannot develop a well-educated workforce. “The Hispanic community is key to the economic future of Texas,” he said. He’s right: In Texas, and particularly Houston, Hispanics are by far the fastest-growing ethnic group, making up more than 40 percent of the city’s total population, and projected to become a majority by 2030. Individual universities and colleges have set their own goals, with programs to help Hispanic students enroll in college and earn degrees, but results are mixed. A 2008 report from Texas’ Higher Education Coordinating Board said the state was “somewhat above target” in raising the enrollment of white and black students, but “well below target” with Hispanic students. The state, which should be at the forefront of the effort, is not only dragging its feet, but is actively opposing measures to level the playing field for Hispanic students, especially those classified as LEP — with limited English proficiency. Not only has the Texas Legislature defunded many areas of public education in recent years — cutting per-student funding by about 20 percent for university students and 35 percent for community college students between 2002 and 2007, as per state comptroller Susan Combs — it is still neglecting to offer measures to provide better programs to LEP students. The state has appealed a 2008 federal district court ruling that it address those students’ needs, the latest in a series of similar rulings since 1981. The recent ruling, to be reviewed in June, pointed out that Texas high schools and middle schools are losing primarily Spanish-speaking students at twice the rate of other students. Texas, with the sixth-largest student population in the nation, ranks 33rd in teacher salaries. Fortunately, thanks mainly to federal stimulus funds, the new state budget, which the Legislature is preparing to vote on, looks to provide a welcome boost to public education funding. Among other increases, the House is proposing that $224 million be added to the base amount of $428 million for the Texas Grants college tuition program, and that $25 million be added to the Texas Opportunity Grant program for older students and those in community colleges. But more funds need to be channeled to the needs of the state’s Hispanic students, and the Legislature should be addressing those needs directly, not by reacting to lawsuits. Time is fast running out: The Texas State Data Center projects that by 2030 — the same year that Hispanics are predicted to become a majority in Texas — the state’s average household incomes will have dropped $3,000 unless more people complete a college degree. From the UT College of Education website. We have a lot to be proud of indeed! The University of Texas at Austin’s College of Education continued its remarkable climb in the U.S. News & World Report - America’s Best Graduate Schools rankings, rising this year to third in the nation among public colleges and schools of education and seventh in the nation overall, tied with Johns Hopkins, Northwestern University, University of California-Berkley and University of Wisconsin-Madison. U.S. News & World Report uses statistical data from more than 12,000 graduate programs and survey feedback from academic and professional experts nationwide to produce its annual rankings of national graduate programs in education, business, engineering and law. This is the highest ranking that the College of Education has ever achieved. Last year the college broke into an elite national tier, being placed fifth among public institutions and 10th overall. This year’s rankings position the College of Education in a top-10 category that includes Harvard, Stanford University, Columbia, Vanderbilt and UCLA. "Since U.S. News & World Report started ranking graduate education programs in 1995," says William Powers Jr., president of The University of Texas at Austin, "our College of Education's rankings have steadily improved, this year reaching third in the nation among public institutions. Innovative research and faculty who are leaders in their fields continue to bring positive recognition to the college, and this consistent show of excellence is to be commended." The high marks awarded to the College of Education this year also include being ranked number one among public universities that offer both undergraduate and graduate programs and ranked fourth overall in research expenditures. The college is ranked second in research expenditures among public institutions, boasting growth in research and development expenditures from around $1.1 million in 1995 to a current figure of around $31 million. At the campus level, the College of Education was the most highly ranked college or school for the second year in a row among University of Texas at Austin graduate programs that receive yearly qualitative and quantitative rankings by U.S. News & World Report. titled, "How to Raise the Standard in America's Schools," appearing in Time Magazine on Wednesday, Apr. 15, 2009. I agree with Dr. Krashen that we can find out what works in education better through other means and also that we don't have to conduct census testing for us to find out what works. Do we need national standards? elsewhere [April 27]. Neither argument holds. reliable and valid measures, and then generalize from these results. other than the treatment that could affect results. how well our children are doing, we do not need to test every child. blood, he takes only a small amount. He doesn't need all of it. recession, according to a report released on Wednesday. of dollars higher, or $3 billion to $5 billion more per day. 19 percent of white students did. major urban districts on reading (they came in second in math). to expire in June. A crucial measurement of Mayor Michael R.
students are black and 40 percent are Hispanic. white and black students it grows 22 percent, the report said. years of learning ahead of their counterparts in California. education, criticized those who opposed their efforts. audience of 200 education leaders at the press club. education bureaucracy had often hindered past efforts. Re: "Study Cites Dire Economic Impact of Poor Schools," April 22.
the report did not dismiss the impact of "out of school factors." The mandatory test is keeping at least 22,500 California students a year from graduating who would otherwise fulfill all their requirements, researchers say. State education officials defend the exam. California's high school exit exam is keeping disproportionate numbers of girls and non-whites from graduating, even when they are just as capable as white boys, according to a study released Tuesday. It also found that the exam, which became a graduation requirement in 2007, has "had no positive effect on student achievement." The study by researchers at Stanford University and UC Davis concluded that girls and non-whites were probably failing the exit exam more often than expected because of what is known as "stereotype threat," a theory in social psychology that holds, essentially, that negative stereotypes can be self-fulfilling. In this case, researcher Sean Reardon said, girls and students of color may be tripped up by the expectation that they cannot do as well as white boys. Reardon said there was no other apparent reason why girls and non-whites fail the exam more often than white boys, who are their equals in other, lower-stress academic assessments. Reardon, an associate professor of education at Stanford, urged the state Department of Education to consider either scrapping the exit exam -- one of the reforms for which state Supt. of Public Instruction Jack O'Connell has fought the hardest -- or looking at ways of intervening to help students perform optimally. Reardon said the exam is keeping as many as 22,500 students a year from graduating who would otherwise fulfill all their requirements. FOR THE RECORD: An article in Wednesday's Section A about California's high school exit exam misstated the findings of a university study about the test. The story said researchers found that girls and non-whites fail the exam more than white boys, who are their equals in other assessments. The study actually found that girls and non-whites fail the exam more than those white boys who are their equals in other assessments. It did not compare them to all white boys. "No one can be happy with these results," Reardon said. "The exit exam isn't working as it was intended." O'Connell issued a statement containing measured praise of the report but defending the exam, saying it "plays an important role in our work to ensure that a high school diploma has meaning." Other officials in the Education Department reacted skeptically to the study, sharply rejecting its assertion that the test has no positive effect on learning. "I'm not ready to agree with that at all," said Deb Sigman, deputy superintendent for assessment and accountability. The researchers, she said, "don't look at grades, they don't look at classroom observation or interviews with children." But Russell Rumberger, a professor of education at UC Santa Barbara who directs the California Dropout Research Project, called the study "very sophisticated" and said policymakers need to take heed of its conclusions and perhaps consider an alternative test. State Assembly Speaker Karen Bass (D-Los Angeles) issued a statement saying that the research "reinforces the concerns that many of us have had about the exit exam from its inception." She said the results "must make us all pause and take stock of whether the exam could be fixed or is fatally flawed." The exit exam, which students can take multiple times beginning in their sophomore year, includes math and English tests, with the math aligned to eighth-grade standards and English to 10th-grade standards. It has been criticized both for being too easy and for unfairly denying a diploma to students who otherwise might graduate. The study, funded by the private, nonprofit James Irvine Foundation, is based on analysis of data from four large California school districts, those in Fresno, Long Beach, San Diego and San Francisco. Reardon said the results were very similar for all four districts, suggesting that the conclusions had broad application for all California schools. Not surprisingly, the researchers found that the exam was toughest on students in the bottom quarter of their class, based on state standardized test scores. That was also where the study found the strongest inequality of results. "Graduation rates declined by 15 to 19 percentage points for low-achieving black, Hispanic and Asian students when the exit exam was implemented, and declined only one percentage point . . . for similar white students," the study said. Low-achieving girls had a 19 percentage-point drop in their graduation rate, compared with a decrease of 12 percentage points for boys. Reardon said he initially was skeptical of the "stereotype threat" effect, but that it has been well-established by social psychologists and appears to apply to the test disparities. Alyssa Lopez, 18, attends Del Mar High School in San Jose in the morning. Every afternoon, she rides the bus to take Jeff Schmidt's three-hour video class at the Central County Occupational Center, a vocational center in San Jose. She's creating a short documentary about animal rights and learning how to edit the images with the latest computer software. "I was going to drop out of school until I found out about this class," said Lopez, who does not have a computer at home. "This is all hands-on learning. I love movies, and I want to learn everything that I can about how they make them. I would cry if they shut this program down." But the future of her course, and other vocational classes across the state, are in question. For decades, programs like regional occupational centers, high school counseling, or gifted and talented education got dedicated education funds. So-called "categorical" programs made sure there were services to properly educate California's diverse student body, from teaching migrant students to training principals on how to use technology. But under the state budget deal crafted this spring, legislators broke such "categorical" programs into three tiers, giving strong protection to two groups but lumping more than 40 programs into a so-called "Tier III" that allows their funds to be raided, or the programs to be eliminated completely. The idea was to give superintendents flexibility in balancing shrinking budgets. "We wanted to knock down the walls," said H.D. Palmer of the California Department of Finance. "School districts said, 'If you're not giving us money, at least give us maximum flexibility.' "
Now supporters for programs as disparate as adult education, music and California Indians are pushing Sacramento to get them out of Tier III. And as local school districts begin crafting next year's budget, groups are urging their superintendents to spare their programs instead of using the money to pay for, say, class size reduction. "This was a major shock to the bureaucratic structure that's been in place for 30 years," said Brett McFadden of the Association of California School Administrators. "Each program has its own constituency and its own followers in the education community, and now everyone is like 'Oh My God, we're going to be cut.' Everyone is lobbying for their program to be spared." School districts had been pushing Sacramento for more categorical "flexibility." With state education dollars shrinking, school officials argued, it made less and less sense for the state to be in charge of chopping up the money. Let local people make the hard decisions instead. "One district may say our biggest need is staff development," said Dennis Meyers of the California Association of School Business Officials. "Another district might say our priority is technology. We finally have a funding system that sends money to the local level without too many strings attached. The problem is that we got it in a really bad budget year." Originally, every program was supposed to be on the table. But certain issues, like class size reduction, had enormous support from teachers and parents, who immediately began a campaign to save it. Other programs like special education came with federal mandates that helped to protect them. Educators associated with the vast majority of the programs in Tier III, however, are deeply worried. And while everyone is grumpy, advocates for adult education, regional occupational centers and gifted and talented education are complaining the loudest. "Basically everyone who is in Tier III wants out," said Rick Pratt of the California School Boards Association, a keen observer of the months-long budget wrangling. "We pushed for there to be no sacred cows — for basically everything to be Tier III. But there was a lot of horse-trading that went on, and the outcome is a compromise driven by politics instead of sound public policy." Teri Burns, a Sacramento lobbyist with School Innovations and Advocacy, is concerned that GATE, or gifted education, now finds itself in Tier III. Children who usually have large vocabularies, ask numerous questions and learn at a swift pace are often identified by teachers and standardized tests as "gifted" when they are in the third grade. Such students attend GATE classes where the work is usually more challenging, requiring different textbooks, specially trained teachers and field trips. The new tier system means school districts could decide to use money that used to go toward GATE for something else entirely. Nora Ho, principal of Ruskin Elementary in San Jose's Berryessa Union School District, also worries that GATE is in the cross hairs. "Being in Tier III means they don't have to give us anything," said Ho. "GATE is vulnerable to cuts because people think that gifted children will make it no matter what." Ho said nothing is further from the truth: Bright children often get bored and act out in class when they are not challenged. "There's a lot of training on how to work with kids who are not doing well. But there's very little training on how to work with the advanced kids," said Ho. "Leave me enough money so that I can continue training my teachers." It's unlikely, however, that the tiers will go away. "My sense is that there's not much political will to move from the structure that was created," said Jennifer Kuhn, director of K-12 education with the state Legislative Analyst's Office. "It's a Pandora's box." Ultimately, the bill pushes Texas to become one of the top ten states in achieving post-secondary readiness. It requires districts to increase the number of students meeting college readiness standards–not just passing standards–and follows students during their college years to see if readiness standards are sufficient to assure college success. The education commissioner determines the specifics of the standards, but the trend toward post-secondary readiness is clear. It offers three high school diploma plans—advanced, recommended, and minimum. Regarding the recommended plan, the bill maintains the current 4 by 4 structure (English, math, science, and social studies requirements for four years of high school), as well as requiring two years of a language. Additionally, it allows students to take eight undefined electives within the recommended plan. (Currently the SBOE defines such electives.) Students on the minimum plan will still have defined electives. However, math and science is only mandated through Algebra II and Physics. The new curriculum also emphasizes Career and Technical and applied classes and allows them to be used in the 4 by 4 plan. The curriculum also gets rid of the unpopular rule that 65 percent of educational expenditures must go to the classroom, which made it difficult to fund other parts of school budgets like cafeterias and school buses. The bill has been a clear priority for the Public Education chairman since the beginning of the session; he spent much of the committee’s first meeting explaining goals the bill contains. He outlined his plan to move away from high stakes testing focusing on minimum performance. “We’re gonna get out of that game,” Eissler said then. At the time, he particularly emphasized that campuses would earn distinction for achievement in specific areas, like closing gaps, 21st Century Workforce Development, fine arts, and physical education (among others). Now Dutton has signed on as a co-author. The turn-around comes after meetings between Eissler and the Mexican-American Legislative Caucus and the Black Caucus. The committee substitute stipulates that all students will be in the recommended track, and they can only opt out if they are over 16, have finished tenth grade (although they don’t need to pass), and have a parent’s permission. To prevent forgeries, the bill also requires schools send out information to parents in both English and Spanish about the advantages of the recommended program. The education commissioner is directed to investigate schools graduating a disproportionate number of students on minimum plan. Although the bill maintains a testing system, it offers flexibility for struggling schools. Student improvement counts towards the passing and college readiness standards, and schools would be recognized for improvement in completion rates. Schools be judged either by a three-year rolling average or by the current year’s performance. Schools making progress would get an extra year before reconstitution or closure to fix problems. After reconstitution, campuses would also get an additional year to meet standards. Additionally, the bill allows repurposing a school as an alternative to closure and prohibits the commissioner from requiring schools to change names. Amendments continue to come forward, and yesterday Diane Patrick and Alma Allen both stated their intentions to continue tweaking elements of the bill. In particular, Allen focused on how to count drop-outs to avoid duplication. Olivo, the only no vote on the committee, argued that in allowing schools to offer unique electives, the bill reversed “the decade long commitment to have a statewide curriculum.” However, she pointed to parts she liked—particularly the addition of parental involvement in opting out of the recommended program. Shapiro’s version of the bill remains in committee. Since 2001, and starting with Texas, ten states have passed laws allowing undocumented students to qualify for lower in-state tuition rates. These statutes continue to be controversial (California’s is currently being challenged in the courts; Oklahoma's was repealed) and legal scholars have written extensively about whether or not they conflict with federal law. Stella M. Flores, meanwhile, has focused on another question – whether or not they work. Flores, an assistant professor of public policy and higher education at Vanderbilt University, finds that they do. In two forthcoming studies, she finds, first, that foreign-born, noncitizen Latinos are 1.54 times more likely to enroll in college if they live in a state with an in-state tuition policy, compared to similar students who don't. Also she finds that, at least in the case of the University of Texas at Austin, undocumented students are as likely to persist in college as their Latino peers with U.S. citizenship. The federal DREAM Act may not have passed, but many now use the term to describe state-level, resident tuition policies, Flores writes. Flores’ study on enrollment, “State Dream Acts: The Effect of In-State Resident Tuition Policies on the College Enrollment of Undocumented Latino Students in the United States,” is forthcoming in The Review of Higher Education. Flores’ dataset is a subset of the Current Population Survey, sponsored by the U.S. Census Bureau and the U.S. Bureau of Labor Statistics, for the years 1998 to 2005. The analysis compares college enrollment of foreign-born, non-citizen Latinos (an imperfect proxy for the undocumented, necessitated by limitations in government survey data, Flores writes), with that of several control groups. “Despite variation in immigration rates, history, and incorporation of Latino immigrant students into each respective state’s school system, the data in this analysis indicate that the policies significantly increased the college-enrollment rates of Latino foreign-born non-citizens, a large percentage of whom are undocumented. Foreign-born non-citizen Latinos are indeed more likely to enroll in college after the implementation of the tuition policies than their counterparts in states without the tuition benefit,” Flores writes. Interesting social experiment. Is this racial or racist? How else could this sense of solidarity be accomplished particularly in light of the value of diversity? It's also too bad that it's all caught up with test scores, too. Race is the national obsession but could this have been handled in a better way? The bleachers in the Laguna Creek High School gym were filled earlier this week with students gazing at an outline of Africa on a big screen. Almost all of them were African American, called together for one of five "Heritage Assemblies" high school administrators organized to pump up kids for STAR testing this week. "Last year we scored the highest percentage increase of any group," Vice Principal Hasan Abdulmalik hollered at the crowd. Most students cheered back in response, but a handful were unhappy they'd been divided along racial lines. And so are some parents. Students at Laguna could go to any rally they wanted, but the gatherings were designated for specific races – African Americans in the gym, Pacific Islanders in the theater, Latinos in the multipurpose room. Laguna Creek Principal Doug Craig said dividing the students by race allowed staff to talk about test scores without making any one ethnic group feel singled out in a negative manner. "Is it racist? I don't believe it is," Craig said. Schools are under increasing pressure to help students do well on "Standardized Testing and Reporting." It's actually a battery of tests that gauge how well schools are teaching their students collectively and in subsets that include race and special needs. If a school falls short of federal benchmarks for more than two years, it could face sanctions under the federal No Child Left Behind Act and ultimately can be taken over by the state. "No Child Left Behind is a double-edged sword," said Craig. "We're doing things as a school that we never had to do. We're being held accountable." California schools are required to make huge increases on test scores over the next four years, a reality that has some schools and their districts feeling desperate. "There is a lot of pressure from the high-stakes testing going on," said Elk Grove Superintendent Steven Ladd. He said the pressure is increased because there is little incentive for students to take the test and schools are required to have at least 95 percent of students participate. But the pressure is no excuse, some families say. Tracy and Herbert Houston said they were angry when their son Kyle was asked to pick an assembly based on race. The mixed-race couple have taught their children that skin color doesn't matter. "My son texted me and asked me which one to go to," said Tracy Houston. "He didn't know where to go because I've never raised him to be black or white. … I tell my children they are part of the human race." Laguna Creek ninth-grader Kevion Claiborne attended the African American assembly Monday; he wasn't happy about the groupings. "We should all go together," he said. "It doesn't matter if you are black, white or any race." Senior Camille Watts, who headed up the student presentation at the rally, said separate assemblies make sense because the tests measure and compare the students based on race. "It ultimately sends the wrong message," said Sharroky Hollie, a professor of teacher education at California State University, Dominguez Hills, and the owner of the Center for Culturally Responsive Teaching and Learning in Inglewood. "The intent is important, but there are many other ways you can do that and have everybody in the same room." He said the practice, however, is becoming more common up and down the state. "I think schools are trying really hard, but not having success," Sharkey said. "But they are not addressing the students' culture instructionally, instead waiting until two weeks before the test and doing heritage rallies." Laguna Creek isn't the only school in Elk Grove Unified to hold race-specific STAR assemblies. Florin High School and James Rutter Middle School are doing it. Monterey Trail High School held STAR assemblies based on ethnicity last year, but students this year asked administrators to divide them by grade level instead, said Elizabeth Graswich, district spokeswoman. Most schools in the region hold rallies or assemblies to motivate students before they take the tests. And most are offering incentives for high scores. Students at Arlington Heights Elementary School in San Juan Unified School District are celebrating Sweet Success Week this week – five days of motivating activities leading up to STAR testing. "When our testing schedule is finished, we reward ourselves with a whole school ice cream party," said third-grade teacher Lynne Sharpe via e-mail. Folsom Cordova Unified School District just took delivery on passes to the Esquire Imax Theater, some of which will be used as incentives for students on STAR testing, said Stephen Nichols, spokesman for the district. Laguna Creek isn't limiting its efforts to assemblies either. Staff members are offering "STAR Cards" that earn high-scoring students homework passes or an extra point on a test, among other things. The school also has a fall barbecue for the class with the biggest improvement in scores. WASHINGTON — The lagging performance of American schoolchildren, particularly among poor and minority students, has had a negative economic impact on the country that exceeds that of the current recession, according to a report released on Wednesday. The study, conducted by the management consulting firm McKinsey & Company, pointed to bleak disparities in test scores on four fronts: between black and Hispanic children and white children; between poor and wealthy students; between Americans and students abroad; and between students of similar backgrounds educated in different parts of the country. The report concluded that if those achievement gaps were closed, the yearly gross domestic product of the United States would be trillions of dollars higher, or $3 billion to $5 billion more per day. This was the second report on education issues by the firm’s social sector office, which said it was not commissioned by any government, business or other institution. Starting in fall 2008, the researchers reviewed federal and international tests and interviewed education researchers and economists. In New York City, an analysis of 2007 federal test scores for fourth graders showed strikingly stratified achievement levels: While 6 percent of white students in city schools scored below a base achievement level on math, 31 percent of black students and 26 percent of Hispanic students did. In reading, 48 percent of black students and 49 percent of Hispanic students failed to reach that base level, but 19 percent of white students did. The New York City schools chancellor, Joel I. Klein, who introduced the findings at the National Press Club in Washington, said the study vindicated the idea that the root cause of test-score disparities was not poverty or family circumstances, but subpar teachers and principals. He pointed to an analysis in the report showing low-income black fourth graders from the city outperformed students in all other major urban districts on reading (they came in second in math). On Tuesday, Mr. Klein was in Albany attempting to persuade legislators to leave control of the city’s schools in the hands of the mayor, a governance model adopted by the state in 2002 that is due to expire in June. A crucial measurement of Mayor Michael R. Bloomberg’s seven years at the helm will be Mr. Klein’s progress in narrowing the achievement gap in a city where 32 percent of students are black and 40 percent are Hispanic. While state test scores have shown improvement since Mr. Klein took office, eighth-grade scores on federal math and reading tests, known as the National Assessment of Educational Progress, have not shown significant increases since 2002. In an interview after the speech here, Mr. Klein said he would be the first to acknowledge that the city was not where it needed to be in closing the gap, particularly in middle schools. But, he added, there have been signs of progress among younger students, and he believed the city’s four-year graduation rates — 69 percent for white students, 47 percent for black students and 43 percent for Hispanic students — could reach state averages within five or six years. He said it would require a focus on finding ways to recruit high-quality teachers. Nationally, the gap in test performance between white and Hispanic students grows by 41 percent from Grade 4 through 12, and between white and black students it grows 22 percent, the report said. Students educated in different regions also showed marked variation in test performance, despite having similar demographic backgrounds. In Texas, for instance, schools are given about $1,000 less per student than California schools, but Texas children are on average one to two years of learning ahead of their counterparts in California. The Rev. Al Sharpton, Mr. Klein’s partner in leading an alliance that is attempting to electrify the cause of making radical changes in education, criticized those who opposed their efforts. “There are no sacred cows in this,” Mr. Sharpton said to the audience of 200 education leaders at the press club. Arne Duncan, the federal secretary of education, told the audience that the report showed the need for robust data systems to track student and teacher performance; for alignment of American standards with those in other countries; and for incentives to keep good teachers and principals. “In many situations, our schools are perpetuating poverty and are perpetuating social failure,” he said, adding that the federal education bureaucracy had often hindered past efforts. He expressed support for the idea of radically restructuring the bottom 1 percent of schools in the country, possibly by closing and reconstituting them. The writers of the study pointed to signs of optimism amid the dreary numbers. Byron G. Auguste, the director of the social sector office at McKinsey, which produced the study, said there was evidence that two dozen countries over the past two decades had significantly overhauled their educational systems and closed achievement gaps. He also pointed to high-performing systems in the United States, like those in Massachusetts and Texas. The trick, he said, would be to share effective strategies. centers that study the history and culture of Mexican Americans. Anglo population, according to the State Demographer’s office. rates and high birth rates, Combs reported. manage the change that is coming,” Alonzo said. front of the ID was in English and the back was in Spanish. forcing universities to do things does not work. with then-Rep. Fred Hill, R-Dallas,” he explained. Barrera, Publisher. All rights reserved. This program as explained in this article seems to putting the onus of failure completely on the student. It doesn't consider that some youth may be "at risk" because they didn't have access to a quality teachers, counselors, and curriculum, or adequate resources. While this program seeks to help youth we need to start addressing and investing in resources as preventative measures so that we're sure to serve ALL students, rather than waiting for the intervention phase when we've already lost high percentages of youth. The reasons are many: poor attendance, academic challenges, the economy, discipline problems, family situations. Those are a few of the scenarios that could cause a student to drop out of school. In Beaufort County, the dropout rate — 5.76 percent during the 2007-2008 school year — has decreased in recent years, although it remains higher than the state average of 4.97 percent over the same time period. But Beaufort County is addressing the issue: It’s examining why students in public schools leave the classroom and also providing an alternative method for dropouts to obtain their high school diploma. The Beaufort County Schools Pathways to Success program, in its first year, serves more than 60 students who for a variety of reasons never finished high school. Beaufort County received $150,000 to implement the new program for the 2008-2009 school year. In October, an additional grant was provided to ensure Pathways would continue through the 2009-2010 term, Oros said. The money must be used to prevent students from dropping out or to fund programs, such as Pathways, that allow those who have already left school to return and finish their high school education. Pathways targets former students younger than age 21 who are looking for a second chance, Oros said. Many of them were struggling in the traditional high school setting and were unable to complete the courses they needed to graduate. Pathways focuses on the core curriculum, including four years of math and English courses, and offers some additional vocational and technical elective classes. Long range plans are in place for the Pathways program, Oros added. Approved by the Beaufort County Board of Education, Pathways adheres to much of the same criteria in place at Washington, Northside and Southside high schools. “The same dress code is in place and the same student code of conduct applies here,” Oros said. Charles Robinson is among students presently enrolled in Pathways. The 19-year-old moved to Beaufort County last year, and like others realized he was falling short on credits. Robinson anticipates graduating in June. He’s currently job hunting and planning to attend a community college, where he hopes to study carpentry and masonry. Robinson hopes he will be an inspiration for younger students in the same situation. Oros said the program is already succeeding. The very first Pathways graduate is now taking classes at Beaufort County Community College. WASHINGTON — The Supreme Court seemed to divide into liberal and conservatives camps Monday during arguments in a case that could limit the power of federal courts to tell states to spend more money to educate students who aren't proficient in English. Some of the court's more liberal justices — David Souter and Stephen Breyer — repeatedly challenged assertions by attorney Kenneth Starr that court oversight of Arizona's English learners program was no longer needed because the Nogales Unified School District, located near the state's border with Mexico, had made progress educating students learning to speak English. Souter pelted Starr, who as special counsel investigated President Bill Clinton in the Monica Lewinsky scandal, with a series of statistics showing a vast gap in academic test scores between Nogales students learning to speak English and native English-speaking students in Nogales and elsewhere in the state. "I'm sure progress has been made," Souter said, "but it doesn't seem to me that ... you could say the objectives are achieved." Starr is representing Arizona state legislators and the state superintendent of public instruction, who want to be freed from a lower court order that the state come up with a new program to teach English learners and provide enough money for that program that it can reasonably be expected to achieve its goal. The state could be forced to spend potentially hundreds of millions of dollars to comply. Starr said the amount of money being spent shouldn't be the issue, but rather that the "sea change" that has taken place in state's efforts to address the problem in the nine years since voters passed a ballot measure requiring intense English immersion for students learning the language. He called the court's continued oversight an intrusion into state government. A key issue in the case, now called Horne v Flores, is the power of federal courts to take over functions of state or local governments when trying to remedy civil rights violations. Parents of students attending Nogales schools sued the state in 1992, contending programs for English-language learners were deficient and received inadequate funding from the state. In 2000, a federal judge found that the state had violated the Equal Educational Opportunities Act's requirements for appropriate instruction for English-language learners. A year later he expanded his ruling statewide and placed the state's programs for non-English speaking students under court oversight. Since then, the two sides have fought over what constitutes compliance with the order. Arizona has more than doubled the amount that schools receive per non-English speaking student and taken several other steps prescribed by the No Child Left Behind Act, a broader education accountability law passed by Congress in 2002. Breyer said the state's increased spending still only amounts to $300 to $400 extra per pupil when estimates suggest it cost from $1,570 to $3,300 extra per student to get the job done. Justice Ruth Ginsburg said the district court was careful not to tell the state what methods of instruction it should use or how much it should spend, only that it come up with a plan to address the problems of English learners and sufficient funding that could be reasonably expected to meet the plan's goals. But Justice Antonin Scalia, part of the court's conservative wing, said he finds "it bizarre that we are sitting here talking about what the whole state has to do on the basis of one (school) district, which concededly is the one that has the most non-native English speakers." The case has attracted a flurry of legal briefs from school boards, teachers and civil rights groups in support of the Nogales parents and students. An array of conservative legal foundations have filed briefs in support of the legislators and the superintendent of schools. The lead plaintiff in the case was Miriam Flores, a Nogales mother. She said her daughter had two years of instruction in her native Spanish, then was put into a class with a teacher who did not speak Spanish, the language the daughter — also named Miriam Flores — spoke at home. She began to fall behind and there were complaints she was talking in class. It turned out she was asking other students to tell her what the teacher was telling the class. Copyright 2009, The Associated Press. The information contained in the AP Online news report may not be published, broadcast or redistributed without the prior written authority of The Associated Press. A report says that in 2025, 35% of the state's working-age adults will hold a four-year degree, while a college education will be required for at least 41% of job-holders. With college enrollment rates among the lowest in the nation, California will face a shortage of 1 million college graduates needed for the state's workforce in 2025, a report released Thursday warned. Unless policy changes are made, only 35% of the state's working-age adults will hold a four-year degree that year, even as a college education will be required for at least 41% of job-holders, the study by the Public Policy Institute of California found. The state's three public college systems -- the California Community Colleges, California State University and the University of California -- educate 2.3 million students annually, and an additional 360,000 students attend private colleges and universities. But the numbers mask a huge gap between the state's youth population and its college-going and graduation rates, the report found. Only 56% of California's high school graduates, as opposed to 62% nationwide, proceed directly to college. The state also ranked comparatively low in other measures, including its share of 25- to 34-year-olds with at least a bachelor's degree and the number of college students who graduated within five years. Many of the state's college students begin at two-year community colleges, but most do not make the transition to four-year institutions, the study found. Although some are seeking certificates, remedial learning or other skills, just 20% to 30% of those with a demonstrated drive to get a bachelor's degree actually transfer to four-year colleges, it said. And although graduation rates at UC are high, only about half of Cal State's students earn a bachelor's degree within six years, the report said. The state's tuition rates and fees remain among the lowest in the nation, but living expenses and other costs force many Cal State students to work while in school, delaying graduation. Cal State spokeswoman Claudia Keith said the system has launched several initiatives to improve transfer and graduation rates. Over the last 15 years, California community college transfers to Cal State campuses have risen 34% to 54,971 annually, and transfer applications for fall 2009 are up 13.7% from the same time a year ago, she said. The report called on educators and politicians to address the enrollment, transfer and graduation issues to try to close the expected gap. A growing share of the children of illegal immigrants are U.S.-born citizens, illustrating a sensitive, demographic shift in the makeup of America’s undocumented migrant population. The Pew Hispanic Center released a report Tuesday estimating that about 73 percent of the children of illegal immigrant parents were U.S.-born citizens in 2008, up from roughly 63 percent in 2003. During that time frame, the estimated number of children born in the U.S. to undocumented parents increased from 2.7 million to 4 million. The report estimates that at least one in 10 Texas school children has a parent in the country illegally. Pew’s estimates were based largely on March 2008 Census Bureau survey data, which was adjusted to account for census undercounting and legal status. The report’s findings highlight an emotional issue in the immigration debate: mixed status families of undocumented parents and U.S.-born children. High-profile immigration enforcement raids across the country in recent years have generated stories of American schoolchildren coming home to find out their parents had been picked up by immigration officials. The demographic shift will have significant implications through the summer as the immigration reform debate heats back up. Last week, the Obama administration indicated it was gearing up to tackle reform, including creating a path to legal status for undocumented immigrants. “These are American citizens, and we’re rounding up and deporting their parents,” said Rice University sociologist Stephen Klineberg, calling the overall immigration strategy “totally bankrupt,” and in need of repair. For example, some anti-illegal immigration groups have proposed eliminating birth-right citizenship for illegal immigrants. The new Pew report offers a demographic snapshot of the nation’s undocumented population, which researchers said tripled in size from 1990 to 2006, before finally stabilizing at roughly 12 million in 2008. Texas ranked No. 2 in the country in terms of the size of the illegal immigrant population, with about 1.45 million. The state had a higher proportion of illegal immigrants in the workforce — almost 8 percent in Texas compared with 5.4 percent nationally. The proportion of Texas school children with an undocumented parent was also above the national estimate of one in 15. One of the report’s key findings — that the undocumented population is made up largely of young, working families — bucks the traditional stereotype of illegal immigrants as day laborers and single men standing on street corners, said Jeffrey Passel, a senior demographer for the Pew Hispanic Center. “This is a different picture than we usually see of undocumented immigrants,” Passel said. Passel estimated that only about a quarter of the nation’s undocumented population is now made up of men without a spouse or children. According to the report, illegal immigrants are far more likely than people born in the U.S. to live with a spouse and children. 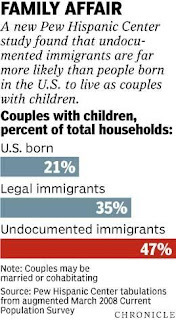 Some 47 percent of undocumented households involved a couple with a child in 2008, compared with 21 percent of U.S.-born homes, according to the report. Vanderbilt Sociology Professor Katharine M. Donato said the Pew Center’s findings highlight a marked shift in illegal immigration patterns, which in turn have changed the demographics of the nation’s undocumented population. Donato said the U.S. immigration system used to be largely cyclical, with workers — legal and undocumented — returning to their home countries on a regular basis, until the massive buildup of agents and infrastructurealong the Southwest border in early 1990s. Facing more dangerous treks and steeper smuggling fees, many illegal immigrants opted instead to bring their families to the U.S. and settle in here, which accounts for the growth in the share of births in the U.S., she said. Key findings in a new detailed Pew Hispanic Center report on the illegal immigrant population in the U.S.
One in five illegal immigrants — and a third of their children — live in poverty, compared with 10 percent of U.S.-born adults. Among illegal immigrants ages 18 to 24 who have graduated from high school, 49 percent are enrolled in college or have attended college, compared with 71 percent of U.S.-born high school graduates. The 2007 median household income of unauthorized immigrants was $36,000, well below the $50,000 median household income for U.S.-born Americans. Researchers found that unlike other immigrant groups, those in the country illegally do not attain markedly higher incomes the longer they live in the United States. • Among illegal immigrants ages 18 to 24 who have graduated from high school, 49 percent are enrolled in college or have attended college, compared with 71 percent of U.S.-born high school graduates. • The 2007 median household income of unauthorized immigrants was $36,000, well below the $50,000 median household income for U.S.-born Americans. Researchers found that unlike other immigrant groups, those in the country illegally do not attain markedly higher incomes the longer they live in the United States. More than half of adult illegal immigrants, roughly 59 percent, had no health insurance during all of 2007. The report found that the undocumented population had dispersed widely since 1990, with recent and rapid growth in the Southeast. Here we go, once more, into the political battlefield that is "immigration reform." As the respective armies assemble to hash out who deserves citizenship and at what cost, we question whether true citizenship can be won by Latinos, whether the citizenship of Latinos will transcend immigration status and reach the very heart of what it means to be an American. In a recent installment of its "Remade in America" series on immigration, the New York Times sets its sights on Irving, Texas, a Dallas suburb, and its Mayor Herbert Gears, whose political survival has depended on the support of Latino voters and his yielding to the prevailing political winds regarding immigration by agreeing to run immigration-status checks on criminal suspects. To illustrate just how emotionally charged the immigration issue is in Irving, readers get this glimpse of recent events at a City Council meeting. Gears asked a woman testifying about the public harm wrought by immigrants, crime, overcrowding, even disease: "Were you at a meeting, a club meeting, where applause was given to the comment that 'anyone who comes over the border should be shot?' "
"I don't remember if there was applause or not," she said, taken aback. As a nation we have arrived at a time when to admit in public, before friends and neighbors, support for the use of lethal force on suspected border crossers raises nary an eyebrow. This is all perfectly reasonable, goes the argument, because presumably we are speaking about illegal border crossers, folks who break the law. But the article, reflecting current political discourse, lumps together immigrant and "Hispanic;" citizenship status, therefore, is rendered irrelevant. But distinctions must be made. The focus on immigration obfuscates the very real way Latinos, U.S. citizens, are upsetting some folks by challenging the status quo. Irving happens to be the site of a lawsuit filed in federal court, Benavidez v. Irving, challenging the at-large voting system that opponents say deprives Latinos of electoral representation, and has resulted in an all-white City Council and mayor governing Irving. At-large systems allow voters to elect citywide representatives rather than pols representing a district. A similar voting model in Dallas was defeated in Dallas in courts. The Irving situation illustrates a significant and enduring struggle for Latinos -- that of being a "class apart." Such was the argument by three Latino attorneys when they won a pivotal civil rights case before the U.S. Supreme Court. It was 1954, and the case, Hernandez v. Texas, was brought before the high court to challenge the all-white juries that were pervasive in Texas and was rooted in the argument that although Latinos were "white," they were "a class apart." This civil rights milestone was recently examined in the PBS documentary, A Class Apart. But now, some 50 years later, the argument that Latinos are a class apart still holds true, but not in the way the Texas attorneys intended. Race alone is not the issue, but citizenship itself. Indeed, rigid racial binaries in this country obfuscate a glaring reality that endures for Latinos today that goes beyond race. In the eyes of the nation, in national discourse, Latinos of all races and backgrounds lack a true claim to national citizenship. One only needs to read the news from New Jersey where immigration agents stormed the home of Dominicans to nab undocumented immigrants. The "Dominicans" were actually U.S. citizens. One only needs to follow the string of anti-Latino attacks -- over 800 in one year -- to see that Latinos exist beyond the racial construct of this nation; and on that frontier our citizenship evaporates. One only needs to follow the incidents of U.S. citizens and legal permanent residents, most of whom are of Central American and Mexican descent, swept up in immigration raids from Long Island, N.Y., to Arizona. And most glaringly, this condition of being a class apart operates at the highest levels of government. Secretary of Labor Hilda Solis is the daughter of Nicaraguan and Mexican immigrants. This fact was repeated in her biographical sketch: She is a new American; she is an immigrant's daughter. But the Obama cabinet consists of several children of immigrants or migrants to this country, who speak at length themselves about scars and challenges of this nation, of this nation's soul. For example, Eric Holder is known as the first African American Attorney General in the country's history. Holder's parents have roots in Barbados. Patrick Gaspar, White House political director (Karl Rove's former post), is a Haitian American. White House Chief of Staff Rahm Emanuel is the son of an Israeli father and was a civilian volunteer assisting the Israel Defense Forces during the 1991 Gulf War. The press or the public has not made much of these other first-generation Americans. But "Latino," the word itself has become synonymous with "immigrant", and those it describes are perpetually seen as immigrants, no matter when their parents arrived on U.S. soil. And, for that matter, in the case of Puerto Ricans, who are automatically U.S. citizens, and many Mexican Americans from the South and Southwest (who never migrated because their lands were once Mexican territories that were ceded to the U.S. as a result of the Mexican-American War), the situation is even more extraordinary. The authors of this piece are a Dominican immigrant who is a naturalized U.S. citizen, and a native Texan who never immigrated (nor did her parents). Both are Latinas, but worlds apart in the way their U.S. citizenship materialized. But in the current paradigm of who can claim citizenship, we are both intrinsically linked to the world of immigration and foreignness. And to many Americans, Latinos' roots are in Latin America and Mexico, as though having some connection with Latin America trumps any possibility of becoming a "true" U.S. citizen. This is not the case for any other group with ties with the rest of the world (i.e. most of the United States). This is the U.S.'s historic denial of its Latin American-ness and its failure to recognize that there is no inconsistency with being a Latin American (or Latino) and a U.S. citizen. To many Americans, including the authors of this article, Latin America is an integral part of U.S. citizenship and history, just as Jewish and Irish and West Indian ancestry are claimed by many a public official. And like them, we make claim to our citizenship. It is what girds us before the storm of the immigration debate. Champions of a proposal to allow illegal immigrants in New Jersey to pay in-state college tuition could be forgiven for believing, after years of frustration and defeat, that their cause may finally have momentum. A blue-ribbon panel convened by Gov. Jon S. Corzine to study immigration matters unanimously supported the proposal in a report issued last month, and the governor has also endorsed the idea. Meanwhile, a new, more liberal wind blows in Washington. But even the most hopeful immigrant advocates in New Jersey concede that these developments may not be enough to push the proposal, which is outlined in several bills, through the State Legislature, particularly during a recession and in a year in which the governor and the entire Assembly faces re-election. Illegal immigrants, advocates argue, should not be penalized for their parents’ actions. Also, they say, allowing students access higher education will encourage more immigrants to excel in high school, multiplying the state’s intellectual capital and empowering its work force. “Maintaining a well-educated work force is integral to New Jersey’s economic vitality as demand for high-skilled labor begins to outpace supply,” the immigration panel’s report said. Ten other states, including New York, have granted in-state tuition to illegal immigrants. Of the six states with the largest foreign-born populations, only New Jersey and Florida have not passed legislation providing the benefit. Similar measures were defeated in recent weeks in Colorado and Arkansas. Marisol Conde-Hernandez, 22, is the kind of New Jersey resident the legislation is designed to help. She was born in Puebla, Mexico, and was brought to the United States by her mother when she was 18 months old. Ms. Conde-Hernandez excelled in school, graduating from South Brunswick High School with a 3.5 grade-point average and a résumé filled with extracurricular activities, even while she was working full time to help support her family. She enrolled at Middlesex County College and then at Rutgers University, where she is a junior majoring in sociology. Since she is not a legal resident, she pays full tuition and fees at Rutgers, and works full time as a waitress to cover what she expects will total more than $20,000 for two years’ worth of credits. She has become politically active, joining the lobby for immigration reform and pushing for the passage of the in-state tuition bills. She decided to speak publicly, in spite of her family’s illegal status, in order to help future students and ensure “that their dreams don’t get completely crushed,” she said. Immigrant advocates say Ms. Conde-Hernandez is a rare exception. When faced with few prospects for affordable higher education, they say, most illegal immigrants underperform in high school or drop out. Opponents say that the measures could result in illegal immigrants taking college slots from legal residents and would cost the state money that could otherwise be used to benefit citizens. “We need to focus our efforts on providing tax relief for middle-class New Jerseyans,” he said in a statement. The bills’ supporters acknowledge that this may not be the most opportune political climate in which to push for passage. Anti-immigrant sentiment is high, they say, particularly during a recession that has made many Americans even less tolerant about providing jobs and public education for illegal immigrants. Moreover, Governor Corzine faces a tough re-election battle, and few think he will expend much political capital on the proposal. Democratic assemblymen may also shy away from the issue to help shore up support among more conservative voters. Indeed, some legislative offices have been swamped by e-mail messages and phone calls railing against the proposal. “It’s dead; it’s going nowhere,” declared William Gheen, president of Americans for Legal Immigration, a North Carolina-based organization that opposes benefits for illegal immigrants and has been lobbying against in-state tuition measures around the country. A new report providing the most detailed portrait to date of the illegal immigrant population found that it is mostly made up of young families that are having children at a much faster rate than previously known. The study, released yesterday by the nonpartisan, Washington-based Pew Hispanic Center, also found that a disproportionate share of such children live in poverty and lack health insurance. Because any child born in the United States has a right to citizenship, the growing presence of these children is likely to complicate the debate over immigration policies aimed at their parents. The question of so-called "mixed-status" families is not new. But the increase in the number of children born to illegal immigrants is likely to exacerbate such situations in years to come. Immigrant advocates and members of Congress, hoping to build momentum for legislation legalizing unauthorized immigrants, have been highlighting the plight of their U.S.-born children in a series of public events across the country in recent months. But the issue also could heighten anxieties in many communities that the U.S.-born children of illegal immigrants will increase demands on schools and social services. The findings, which analyzed census data, also suggest that the impact of the unprecedented increase in illegal immigration over the past three decades will continue to be felt for years to come, even as the size of the illegal immigrant population appears to have leveled off since 2006 at about 10.4 million adults and 1.5 million foreign-born children. By contrast, the number of children born in the United States to illegal immigrants rose from 2.7 million in 2003 to 4 million in 2008. Children of illegal immigrants now account for about one in 15 elementary and secondary school students nationwide and more than one in 10 students in five states: Arizona, California, Colorado, Nevada and Texas. The vast majority of these children were born in the United States. In 2007, the poverty rate for such children was almost twice as high as for those born to either legal immigrants or U.S.-born parents. Similarly, U.S.-born children of unauthorized immigrants were about twice as likely not to have health insurance in 2008 as those born to legal immigrants and three times as likely as those born to U.S.-born parents. The Census Bureau does not ask people their immigration status. So the authors used a technique that estimates the number of legal immigrants using other government records, such as immigrant admissions, then subtracts that population from the total number of foreign-born estimated by the bureau to come up with the number of illegal immigrants. It analyzed census statistics from March 2008. The spike in births to unauthorized immigrants -- 70 percent of whom come from Mexico or Central America -- is largely due to their relative youth compared with the general population, as well as their greater propensity to marry and have children. The result, said co-author Jeffery S. Passel, is "a different picture than what we usually see of undocumented immigrants. We usually see the young male day laborers on street corners. But only a fourth of undocumented immigrants are men who are here by themselves without spouses or children. This is a population that is largely made up of young families." Passel added that this "complicates greatly the difficulty of coming up with policies to deal with this population. . . . While we may be able to fit people into boxes of 'undocumented,' 'legal,' 'legal temporary,' and 'U.S. citizens,' it's not so easy to fit families into that same set of little boxes." The study's findings also point to the continued geographic dispersal of illegal immigrants since 1990 across southeastern states with little prior history of immigration. Although longtime magnets such as Florida, Illinois, New Jersey, New York and Texas retained their appeal -- and California continues to house the largest number of unauthorized immigrants -- growth there has slowed compared with such states as Georgia and North Carolina. Similarly, in Virginia, which ranks 10th in number of illegal immigrants, the unauthorized population quintupled since 1990 to 300,000 and accounts for 4 percent of residents and 5.1 percent of workers. Maryland ranks 11th with an estimated 250,000 unauthorized immigrants, comprising 4.7 percent of residents and 6.7 percent of workers, and the District's 30,000 illegal immigrants make up 5 percent of the population and 7.1 percent of the workforce.